and last, I'm going to post it on the crowdfunding site if it's a good response after I've made the motor brick prototype. So what if there was a third-party motor with better performance? 1) If the performance is good, it can be purchased. 2) Because it is not Lego, it is not purchased. Other - It would depend on whether I needed it. thanks for your answer, look nice! I saw this before, and I would really like to have something like that, even if it's as powerful as a micromotor. (2) Speed <-- A large or xl motor that has lots of speed. For RC car/ripsaw things. (3) PF Series's was fine, just need more torque <-- I like PF. (1) Round (Like XL Motor) <-- L and XL motors best shape because of technic stud holes. (1) ﻿Torque(strength) it has to have a good balance. 1) If the performance is good, it can be purchased. im currently using third party motors for my smaller builds. I think to answer your questions I would say the perfect all rounder would be to take an L motor and remove the internal gearing. This would also likely mean you have an output axle instead of an axle hole. I want lots of mechanical output power but I want it in the form of high RPMS rather than torque. 42055 is a good example of the XL motor having too much torque to be useful in most cases. An M motor can make two white clutch gears slip when geared the same as the XL motor in 42055 so why use an XL motor? It forces the designer of 42055 to have these long axles be driven very slowly with lots of torque, which causes axles to twist which contributes a lot to it's jerky stop-start motion. Better to have the same mechanical output power delivered as high RPMS rather than torque so we can have more flexibility in designing our drive trains. A long thin shaft spinning much much faster but with less torque won't twist as much but will be able to deliver the same amount of mechanical power. You just put the majority of the gearing down at the point where it is needed, in the case of 42055 this would be after any long axles, not before, which having all this gearing inside the current PF motors forces you to do. 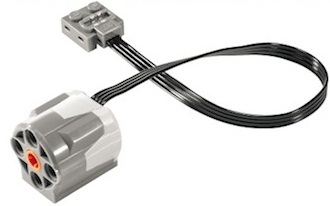 Really the best thing would be to take a current PF L motor a split it in two, so you have a completely ungeared motor with output axle, and a separate planetary gear reduction unit with input and output axle holes, that can be placed anywhere in the drive train as many or as few times as the designer wants. This would be the ultimate in terms of flexibility. (2) Speed -> Gotta Go Fast! As of right now [IMO] , there's a gaping hole in between motors, with the max torque dominated by XL, M on the mediocre range, L being the island in between, and old-gen buggy ones ripping it on speed line. So maybe something faster than a m-motor but not losing too much on torque and (maybe) being a stud or two smaller. Imo the important thing is the compatability with PF as not only connectors, but receivers as well, as those have issues with overpowered stuff. thanks for taking your time and have a nice day!